Image Credit: Dino Ignacio, via Imgur. Credited for all images unless otherwise stated. When you go to a massive convention like Star Wars Celebration, it’s best to have a game plan. Where are you going to go first? What panels are you going to prioritize, and which merchandise do you want to make sure you don’t miss? 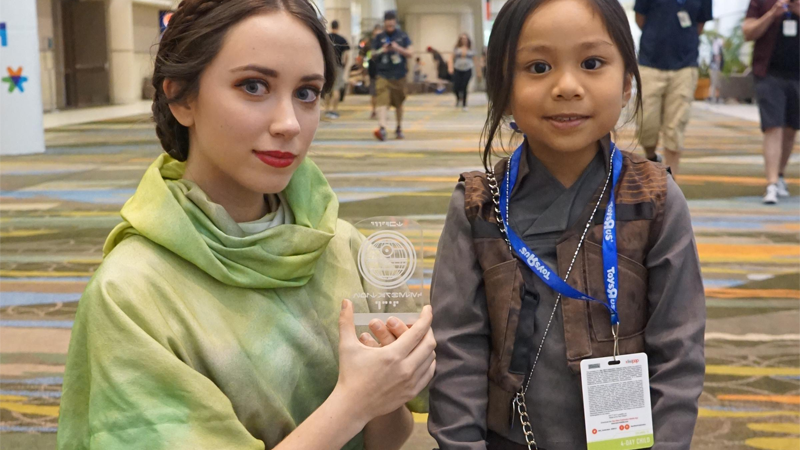 Well, this little Jyn cosplayer had a different mission: deliver the Death Star plans to every Leia she could find. Jyn is actually named Harley, and she and her father Dino attended Celebration in Orlando last weekend with a special goal in mind, to pay tribute to the dearly departed Carrie Fisher. Harley, in costume as Rogue One’s Rebel Operative, would locate as many Princess Leia cosplayers as she could, and hand them a specially-crafted copy of the datacard containing the Death Star plans. After all, that was the whole point of Rogue One! Whether it was a Leia from A New Hope, Empire Strikes Back, Return of the Jedi, or even General Leia from The Force Awakens, Harley completed her mission all over the convention, ensuring that the Imperial plans made their way to the Alliance, an adorable quest of hope. The final datacard was saved for one special location on the show floor, though: at the feet of Leia’s ceremonial dress, the original prop from the end of A New Hope worn by Fisher. Well done, little Rebel. The Princess would be proud. You can see more of Dino’s pictures from Celebration over on Imgur.